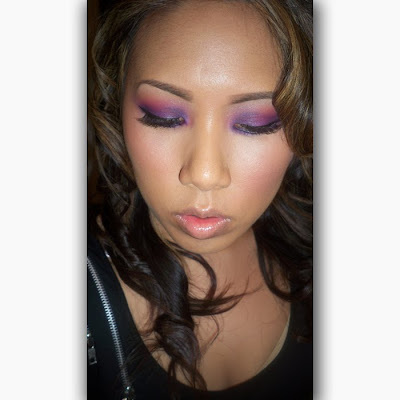 Today I'm brining you another fun, colorful look using the 88 Matte Palette from www.sedonalace.com. You all know I'm a huge fan of matte colors so this palette is right up my alley. I would still recommend using an eye base to maximize pigment and lasting powder. To see the final look and giveaway, click here! Sedona Lace has generously sponsored an 88 Matte Palette for one lucky reader. 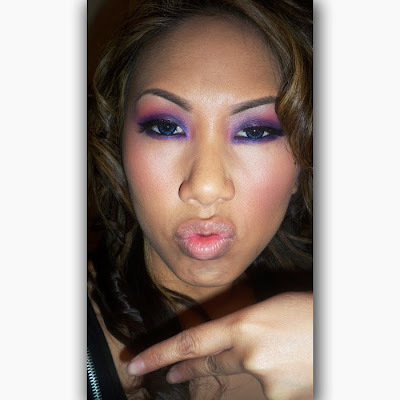 Also, if you would like to order a palette for your own, check out http://www.sedonalace.com and use coupon code renren for $4.00 off your order...coupon does not expire. I'll pick a winner at random and announce it later this week on my blog. FTC Disclosure: Palette featured in this review was provided by the company for review. I am not affiliated with this company and have not been paid to write this review. These are my honest thoughts and opinions. I"m always looking for new makeup to try. Plus something like this is great because you lots of color options with out having to buy a ton of products. Love the look you created!! its beautiful. I'd love to win this particular palette! Will be PRAYING that I am picked!!! I would absolutely LOVE to win this palette! I have been trying to find a palette that really looked like I would like it for a long time and I think that the Matte colors would wok wonders for me. I don't think I hold shimmery shadows very well so this would be perfect! I am always looking to experiment with new colors and all the colors here re gorgeous! Not to mention I LOVE pink and the look you made in your tutorial was beautiful! Please pick me! And thank you for all your giveaways, it is really awesome that you have these! I would love to win the 88 palette because it has lots of amazing colors to play with ! I'd love to have Matte 88 Eyeshadow Palette which has great colors ! I would love to win the 88 Color Palette! The colors are so fab and gorgeous!! Thanks for this giveaway! 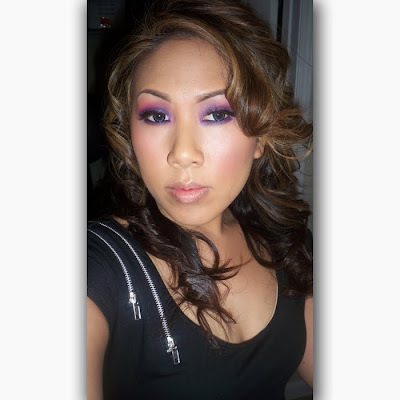 Hi Ren Ren, I only recently started using makeup and would like to move from shimmery colors to trying out more mattes. This palette would be great to add to my newbie collection! I'm a bit of colors and would love to try this palette offering a huge variety. Thanks for doing the giveaway!! very nice of you! I would like to win this palette because that way I could travel with one palette and create multiple looks. I would absolutely LOVE to win this because I'm a teenager, and cannot find a job for anything, and these days all the money I do have goes to fixing my old beat up car. >.< so I think this would be great because I could get a lot of colors so I wouldn't have to go out and try to bye a whole bunch. The matte palette is what I would want to win because I have maybe 3 or 4 matte shadows. I want to start expanding my options because so many tutorials use matte colors. I am going to try the Purple and Pink Rocker look with my shimmery shadows. Thanks for the tutorial. Love to see colorful makeup...I'ld love the matte palette..
Ren, this look you did with the 88 matte palatte is beautiful and fun. I am getting started in this freelance makeup artist stage and I know having a palette like this will allow me to create fabulous looks seeing as it provides various shades/hues throughout the color wheel. Not to mention all the space I will have saved in my travel case when I am on location with clients. Thanks so much for making it possible to win one of these awesome palettes. Blessings. tgiF! Of course I subscribe to your YouTube Page and follow your blog! What an awesome giveaway :) as always. I would love to win this 88 matte palette. I just LOVE this look that you did, and love watching your tutorials on YT. Especially since its spring, this palette would help me try out different looks. I'm a stay home mom and I would love to win this palette so I can play with the colors because all I do all day is just online and looking at makeup. LOL. I love how you do your makeup just too bad my eyes are too small and can't do what you did. Thank for the giveaway!!! i would love to win because all of the makeup i currently have, which is minimal, is shimmer and i REALLY want to try using matte colors now! Hope I win. Love the palette and love the look you done. I would love to be picked as the lucky winner of the 88 matte palette since I am new to makeup and loving all the make up tutorials I have seen on You Tube. Unfortunately, I do not have any many makeup at all. So this would be a blessing if I would win this palette. i already have the shimmer one and i would love to have a chance to win this one if i could... and love the look! Thank you for this giveaway! I would love to win, as finding good-quality high performing matte eyeshadows is so hard nowadays. This palette sounds like the perfect solution. I am stuck in a neutral rut. I would like to experiment with colors. I prefer mattes. This would be a goof start. wow! this is so awesome..
i would love to win Ultra Shimmer 88 Eyeshadow Palette.. because i've never tried it..and wanna try it and the colors are so amazing with the shimmery on it. i would love to win the 88 palette because i love the variety of colours and would to love experiment with them. i'd love to win because i love all the bright colours. Hi Ren! I would love to win this palette! I am a huge fan of matte colors! Ps: I love your look! RENREN!i love that look its soo beautiful. RENREN i would love to win that palette because i love colors and i would love to try out blending the colors and having my first makeup palette. Also, this would be great if i could win because prom is coming up and many of my friends asked me to do their makeup and i would love to have a different colors to make them look beautiful for prom. Thank you for this awesome chance of a palette giveaway! I LOVE matte colors so this would be perfect! PS lol sorry forgot i do follow you on youtube and blog! I don't have a large paletee, or many matte shadows in my kit, so I'd love to win! i would love to win this palette cuz i would lik sum color in my life. i wear mostly neutrals. I'd love to win, I love the idea of the matte palette because I seem to have so many shimmers. What I love about matte is that you can have the option of adding shimmer later over the top if you want! Great give away!!! Id love to win this palette coz im in to coastal scents big time. i already have the neutral palette. and the look u did on youtube was great too. I would love to win the matte eyeshadow pallet because it has some beautiful colors in it and I know those shadow colors have my name written all over it. i would love to win the palette because i dont have one like it and i also love matte colors! Im so in love with that palette... Ive been wanting it for so long. I tend to go for things that are tangible because purchasing online can be kinda scary. I want to win the matt pallete because I notice that I do not own any matt eyeshadows.I just start out with makeup and since those glittery shimmery ESs just attracted my eyes I tend to buy them rather than buying the matt shadows. I want to have this pallete b/c I think matt really give u more dimension to the eyes. I would love to try out the 88 matte palette!! The colors look amazing and so pigmented!! Your tutorial also made me "need" to try the palette out! LOL. Thanks for this giveaway!!! I would love to win the matte pallete because it has soo many colors and I would love to try out many looks with all the different color options the looks are endless. The palette looks amazing and I love matte colors, so it would really be nice to win it. Thanks for doing the tutorials. Love them. i love matte eyeshadows! i would love to win this. Thank you for the giveaway !! I mostly use very bright and high pigmented hues so this 88 Matte palette is definitely welcome in my make up collection so i can work with more subtle shadow..
i would love love love to win this palette because i have recently fell in love with make up, especially eye shadows. i am really excited to try new things, but being a single parent has really put a limit on the amount of things i can do/buy for myself. winning the palette would be great for me because i would be able to experiment with so many colors and try so many new looks on my eyes. thank you so much for inspiring me to use make up!!! I've always wanted to try the 88 palette! I'm following your blog and YT (I'm "Chinandjuice" on both Twitter and YT). I'd love to win as I've tried Matte shadows from MAC but they're colour payoff's not that great while the 88 palette I've heard has great colour payoff and I love Matte shadows, would love some that'll actually work...thanks!!! i love using mattes as well. thanks! I would love to win the 88 matte palette because the colors are so beautiful and seem very nice to work with due to the various amounts of colors available. Hi RenRen... hot pink is my favorite color as well!!! I'd LOVE to win this pallette because it has that hot pink color in it, and it's hard to find a really nice pink eyeshadow to work with! I enjoy watching all your vids, and consider you like THE BEST makeup guru on Youtube thus far! Thanks for putting up all the info that you do to help us women look beautiful like you! Keep up the awesome work! Take care and God Bless! Hi Ren! I would be interested in winning the Matte e/s Palette because I just started doing youtube videos and the only makeup I wear is mascara and lipgloss. I'm going to be doing a series on me learning how to apply it properly with the help of the makeup gurus on youtube. I ordered a small palette from Sephora this week. However, this one has many options and its matte. I want to start off small and think shimmery closers would be too much for me right now since I am a beginner!! I appreciate you having this contest! I love what you hav done in this tutorial, its so beautiful. id love to win this as i would like to try out different types of makeup and i would love to try out this matte pallete! i'm just starting out in makeup and i think this could work wonders for me! thanks! I'd love to win because I live in Europe and it is soooo hard to get your hands on products like that! They don't really sell them here and the shipping rates are CRAZY!!! I love this palette.. Please please please make me win it!! haha.. I am a newbie in make-up and i aspire to be a professional make-up artist, i dont think anybody needs it more than me.. :D ., Believe it or not i even dreamt about this very same eye-shadow palette!! this is so gorg (as usual!). i think i tried a look like this before (don't we all love purple and pink looks?) but mine didn't look like this. i'm inspired to try it again! thank you for the giveaways...so, i really would like to win this palette because i've always used shimmer eyeshadows and this could be a chance for me to try matte ones! I am trying to expand my very small e/s collection, and I'd love to try some of your gorgeous looks. I'd like to win this because I need new makeup!!! i would love to win the ultra shimmer palette cause ive been so curious bout that for the longest time..
OH, my GOD!!! I was just thinking a few days ago at this palette! The matte one is like a dream come true to me and I would soooooo luv to win it!!! U are awesome! God bless! I would like to win because the colors of this palette are awesome!! I would like to get and use this palette so I can follow your tutorials. bec you have excatly my skin tone and I am so new to makeup. your tutorials are already helping me but with a pallette I get to try these great colors!! thank you. th palette has loads of colours which means that loads of great looke can be created. it would be a great oportunity to win this because it`s a great pallete..it has a lots of colours and you can creat a ton of different looks.. I would like to win because I love matte eyeshadows as well and those are really pretty colours. I've heard a lot about it, and have always wanted to try it, especially for the matte shadows. I'd very much like to win this palette because 1) I don't own many matte shadows, and 2) I LOVE colorful makeup. I'd love to win this palette because I would like to be able to do the looks people use with it. Also my nieces love it when I do their makeup and I have a limited amount of eyeshadow colors. This would be perfect for it! I'd love to win this palette! My nieces love for me to do their makeup and have this range of colors would be perfect for it! I want to win this! It's matte, and there are beautiful colors. hey... is this the same palette as the one from coastal scents? it looks like it, but i wasn't really sure.. I would LOVE to win this Pallet I have never had one before and I would love to do more with my eyes, color wise, then just browns and tans. I would love to win the Matte 88 Eyeshadow Palette, just cause I feel that there are not enough brands out there that have nothing with just matte colours, so many creations so little time with that pallet what to do what to do. I do not have any palette. Excuse my english , I speak only portuguese. I would really like to win this 88 Matte Palette. I have never had a large mass pallet of eyeshadow and I think it would be something great to start off building my own make up kit. I love shimmers so I need to try mattes! I am so praying that I win this giveaway! Love the look you have worked with it as well! I have just recently got involved with make up - it has alwasy been an interest for me but i never really wanted to give it a better go and here i am today loving make up and trying so many new looks!! I would love to win the Mac 88 Pallet as i have always loved mattes, just so much fun to work with and not over powering as so many simmers are. I would like to win this palette because I like matte colors and there's a great variety. I'd love you to pick me for this giveaway! I don't have much good quality make up yet as until recently I've always used minimal makeup. In the last 6 or so months I got really interested in how fun and creative make up can be. It's such a fun art form. The 88 Matte Palette would really add to my collection and let me try so many new things! OMG! I couldn't wait. I ordered the palette anyway. Haha! LOVE you blog. I would love to win the Ultra Shimmer 88 Eyeshadow Palette because I'm in need of colors in my life! I've never used any palettes like this before. Would love to win! I simply love this pallet and would really like to win this give away! The purples in this pallet seriously have caught my eye. I'd love to sit down and have a chance to try out these colors. I would raeally like to see what else looks good on me besides skin tone natural color looks. I would love to win the matte palette cuz it would help me build my arsenal and give me a way to find out if i can work with anything but neutrals. cuz that's all i have now!!!!!!!!!!!!! I'd love to win because I'm pretty new to makeup and I don't have a huge collection so I'd love to have this palette so I can do more of your gorgeous looks (especially the Rock Star one!) using the colours in here. Thank you for this giveaway! I WOULD LOVE TO WIN THIS COMMENT B/C I AM LOOKING TO EXPEND MY MAKE-UP COLLECTION SINCE I AM PRETTY NEW TO USING MAKEUP AND I THINK THE 8 PALETTE WOULD BE A GREAT START, TO CREATE SOME LOOKS!!! I'd love to win this because I am always looking for matte shadows! Thanks Ren! I'd love to win because i've been thinking of buying such a palette. It would be great to have it for free ! The matte palette is awesome! I would love to win b/c I only own 3 matte eyeshadows and I need more! I'd love to win this pallette as I'm sorta new to make-up and this would bring out a whole new world of colours for me to try. I would love to win the 88 matte palette because I would love to work with matte eyeshadows on myself, my friends and family. hey i wanna start off by saying you are beautyful!! I would love to win the matte palette, because I don't have a lot of practice with matte shadows and this palette gives you all the colors of the rainbow! I would love to win this palette because you could create so many endless looks with all these beautiful shades. The look you created is fabulous! Thanks for a chance to win this giveaway. I am an aspiring makeup artist, and am trying to put together my first professional makeup kit. I believe this would help me be more versatile for my future clients! If I won, I would give the palette to my mother. She loves playing w/ bright eyeshadows. I would like to win in order to conserve money. Buying separate eyeshadows add up. I'm always looking for bright, interesting matte colors, this palette has more than enought to play with for fun looks (especially with summer on the way!) Love ya Ren! You are such a rockstar to us! it would be such a joy to win this matte palette, I love it!!!!!!! Thank u for this opportunity! God bless u! The matte palette looks SUPERBE!!! Sign me up please!!!! HI, REN I WOULD LOVE TO WIN THE 88 MATTE PALETTE BECAUSE I HAVE A SHIMMER ONE BUT IT BROKE. MY LITTLE NIECES DROPPED IT WAY TOO MANY TIMES! HA! WASN'T FUNNY THEN BUT FUNNY AND SAD NOW! I WOULD LOVE TO TRY THIS GORGEOUS LOOK WITH THE MATTE PALETTE. THANKS! i've never gotten the chance to experiment with so many different matte colours before! thank you for having this giveaway renren!! I'd love to win the 88 Matte Palette! I don't have too many matte eye shadows so having this would add a few to my collection. I really loved your pink/purple rock star eyes and would love to try it! I would love to win this matte 88 palette, because I am begining to learn to wear eye shadows and this palette would be a great edition to my journey. I have been in the Army 10 years and lets just say I can wear eye shadow in uniform so I never really learned, so now I am and it would be great to have a large variety of colors to use. I would love to win the matte palette b/c I need some diversity in my life, I have shimmer, just not enough matte!! I would love to win this matte 88 eyeshadow color because, I have heard such great things about this palette, and almost every youtube guru I watch has it and uses it in like every tutorial they do. It would be really cool if I could actually follow their makeup with the same products they are using. first of all, much mahalo for this giveaway! i would LOVE to win the 88 matte palette because i am an inspiring makeup artist who doesn't have enough money to go to beauty school at the moment. so i've been doing side jobs such as putting makeup on girls to make a portfolio out of it. Doing this side job is actually fun but a lot of makeup to buy. I really want a matte palette, it's so versatile and the possibilities are endless. I'd love to play with it, create different looks. I am very happy to enter this giveaway,this is an awesome giveaway!! Also,I love your make up tutorials.Please make more videos!~I want to win,please enter me! Hi Ren Ren, I would love to win the 88 matte palette as I would be able to do my normal everyday look with the neutrals but also experiment with new colors. I prefer matte over shimmer so this is the perfect palette for me. Thanks for the giveaway! 2- My friends are getting married soon too and I want to do their make up! P.S. I learned how to do a smokey eye from you! I would love to give this pallet to my best friend. She's had a really rough couple of months and she's just beginning to return to her old self now. She was involved in an abusive relationship for far too long and now that she is out of it, I want her to focus on something more fun. I know how much fun it can be to experiment with different colours and I know that she, too, will have fun if she has this pallet. It would be a GREAT opportunity for her to focus her attention somewhere else and get her act together. Im also a youtube subscriber, Lovely giveaway, I would love to win for once jejeje, I never won anything , nor have this great makeup. im not sure if im late or not but i would like to enter because i never got the chance to try this pallet it has nice sades of color i would love to try and experiment with but who wouldnt lolz. anyways thanks for holding thins im sure everyone is glad. ive been a follower on both youtube and on here for a whileee.i enjoy your videos. Hei I really want to win this..because i have no palettes and this seems to be perfect palette.. and also in my cpuntry we can only find something a like palettes in professional make-up stores and they are very very expencive...so i really want to win this and i have my graduation coming amd I want to look pretty and this palette gives me all what i expect from make-up :) it is perfect! I would love to win this palette because I dont have a great variety of colors, and I really love creating new looks, so this would make that possible.